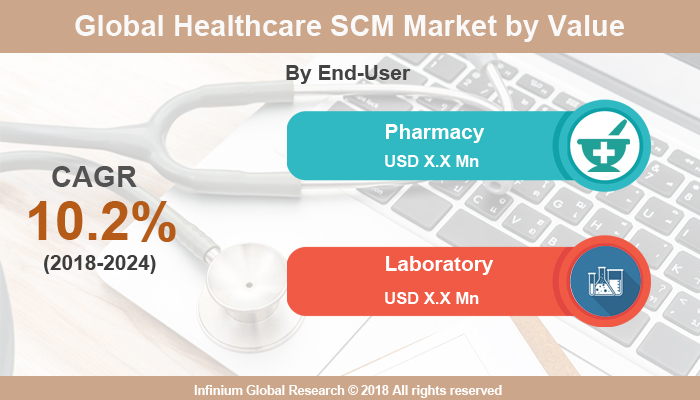 A recent report published by Infinium Global Research on healthcare supply chain management market provides in depth analysis of segments and sub-segments in global as well as regional healthcare supply chain management market. The study also highlights the impact of drivers, restraints and macro indicators on the global and regional healthcare Supply chain management market over the short term as well as long term. The report is a comprehensive presentation of trends, forecast and dollar values of global healthcare supply chain management market. According to report the global healthcare supply chain management market is projected to grow at a CAGR of 10.2% over the forecast period of 2018-2024. The substantial rise in the healthcare and pharmaceutical sector is likely to boost the growth of the market. The healthcare supply chain management helps for financial management, labor optimization, and smooth flow of information throughout the entire supply chain. The needs of cloud-based solutions to keep the record, track and trace the delivery of drug or device that are shipped are covered in the supply chain management. The implementation of inventory management system with the GS1 system of standards in healthcare removes counterfeit products and reduces the human errors thus increasing the patient’s safety. The accuracy of ordered drugs, and medical devices is increased in supply chain management system. The manufacturing companies (producers), wholesalers and distributors (purchasers), and hospitals, pharmacies, and clinics (providers) are three main streams in health care where supply chain management is used. The presence of e-commerce solutions leads to error free manual processes from the supply chain, subsequent increase in profitability with less process cost. supply chain risks hamper business routine by affecting business operations and financial stability. In addition, growing efforts for high-quality services to deliver on time, increasing dispersion and implementation of various components such as software and cloud-based solutions, and technological advancements in automation of the processes is likely to boost the growth of the market. On the other hand, the implementation and maintenance cost of healthcare supply chain management solutions is very high is likely to hamper the growth of the market. The health care supply chain management market is segmented on the basis of component, deployment model and end-user. The component segment is further divided into software and hardware. The software accounted for the largest share in the market as due to adoption of the new inventory management software, customer relationship management and execution of value chain transactions. Among the regions, North America is expected to be the largest market for health care supply chain management. The presence of the leading pharmaceutical companies is the key factors drives the growth in this region. The demand of supply chain management system in healthcare is high in the U.S. Moreover, the Asia-Pacific region is projected to grow at the highest CAGR among the regions. The growth in Asia-Pacific region is mainly driven by emerging countries such as India, China, and Japan and growing healthcare sector. The merger and acquisition and business expansion are the key strategy of the leading player in this market. For instance, all scripts Healthcare Solutions, Inc. acquired McKesson's health Information Solutions business, in 2017. The report on global healthcare supply chain management market covers segments such as, component, deployment model and end-user. On the basis of component the global healthcare supply chain management market is categorized into hardware and software. On the basis of deployment model the global healthcare supply chain management market is categorized into on-premises and cloud based. On the basis of end-user the global healthcare supply chain management market is categorized into pharmacy and laboratory. The report provides profiles of the companies in the global healthcare supply chain management market such as, Mckesson, Oracle, Cardinal Health, Cerner, Microsoft, Airclic, Solstice Medical, Epicor, Manhattan Associates, Mayo Clinic and Infor. The report provides deep insights on demand forecasts, market trends and micro and macro indicators. In addition, this report provides insights on the factors that are driving and restraining the global healthcare supply chain management market. Moreover, IGR-Growth Matrix analysis given in the report brings an insight on the investment areas that existing or new market players can consider. The report provides insights into the market using analytical tools such as Porter's five forces analysis and DRO analysis of healthcare supply chain management market. Moreover, the study highlights current market trends and provides forecast from 2018-2024. We also have highlighted future trends in the healthcare supply chain management market that will impact the demand during the forecast period. Moreover, the competitive analysis given in each regional market brings an insight on the market share of the leading players. This report will help manufacturers, suppliers and distributors of the healthcare supply chain management market to understand the present and future trends in this market and formulate their strategies accordingly.